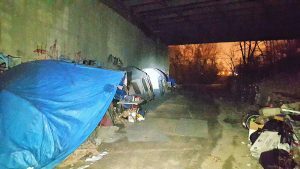 Columbus has one of the worst homeless problems the Sub Zero Mission sees. Thanks to Neal Palmquist, who is part of the NCR Ambassador Program, our Marketing Director Frank Vaccariello was hooked up with a Columbus radio station for a 20 minute segment. We’d like to thank Chuck Douglas of 98.9 The Answer for allowing us to spread the word. You can hear the entire conversation here.